What Does a Technical Indicator Offer? This article is designed to introduce the concept of technical indicators and explain how to use them in your analysis. We will shed light on the difference between leading and lagging indicators, as well as look into the benefits and drawbacks of both. Many (if not most) popular indicators are shown as oscillators. With this in mind, we will also show how to read oscillators and explain how signals are derived. Later, we will turn our focus to specific technical indicators and provide examples of signals in action. A technical indicator is a series of data points that are derived by applying a formula to the price data of a security. Price data includes any combination of the open, high, low or close over a period of time. Some indicators may use only the closing prices, while others incorporate volume and open interest into their formulas. The price data is entered into the formula and a data point is produced. For example, the average of 3 closing prices is one data point [ (41+43+43) / 3 = 42.33 ]. However, one data point does not offer much information and does not make for a useful indicator. A series of data points over a period of time is required to create valid reference points to enable analysis. By creating a time series of data points, a comparison can be made between present and past levels. For analysis purposes, technical indicators are usually shown in a graphical form above or below a security's price chart. Once shown in graphical form, an indicator can then be compared with the corresponding price chart of the security. Sometimes indicators are plotted on top of the price plot for a more direct comparison. A technical indicator offers a different perspective from which to analyze the price action. Some, such as moving averages, are derived from simple formulas and the mechanics are relatively easy to understand. Others, such as Stochastics, have complex formulas and require more study to fully understand and appreciate. Regardless of the complexity of the formula, technical indicators can provide a unique perspective on the strength and direction of the underlying price action. A simple moving average is an indicator that calculates the average price of a security over a specified number of periods. If a security is exceptionally volatile, then a moving average will help to smooth the data. A moving average filters out random noise and offers a smoother perspective of the price action. Veritas (VRTSE) displays a lot of volatility and an analyst may have difficulty discerning a trend. By applying a 10-day simple moving average to the price action, random fluctuations are smoothed to make it easier to identify a trend. Indicators serve three broad functions: to alert, to confirm and to predict. An indicator can act as an alert to study price action a little more closely. If momentum is waning, it may be a signal to watch for a break of support. Alternatively, if there is a large positive divergence building, it may serve as an alert to watch for a resistance breakout. Indicators can be used to confirm other technical analysis tools. If there is a breakout on the price chart, a corresponding moving average crossover could serve to confirm the breakout. If a stock breaks support, a corresponding low in the On-Balance-Volume (OBV) could serve to confirm the weakness. According to some investors and traders, indicators can be used to predict the direction of future prices. Indicators indicate. This may sound straightforward, but sometimes traders ignore the price action of a security and focus solely on an indicator. Indicators filter price action with formulas. As such, they are derivatives and not direct reflections of the price action. This should be taken into consideration when applying analysis. Any analysis of an indicator should be taken with the price action in mind. What is the indicator saying about the price action of a security? Is the price action getting stronger? Weaker? Even though it may be obvious when indicators generate buy and sell signals, the signals should be taken in context with other technical analysis tools. An indicator may flash a buy signal, but if the chart pattern shows a descending triangle with a series of declining peaks, it may be a false signal. On the Rambus (RMBS) chart, MACD improved from November to March, forming a positive divergence. All the earmarks of a MACD buying opportunity were present, but the stock failed to break above the resistance and exceed its previous reaction high. This non-confirmation from the stock should have served as a warning sign against a long position. For the record, a sell signal occurred when the stock broke support from the descending triangle in March-01. As always in technical analysis, learning how to read indicators is more of an art than a science. The same indicator may exhibit different behavioral patterns when applied to different stocks. Indicators that work well for IBM might not work the same for Delta Airlines. Through careful study and analysis, expertise with the various indicators will develop over time. As this expertise develops, certain nuances, as well as favorite setups, will become clear. There are hundreds of indicators in use today, with new indicators being created every week. 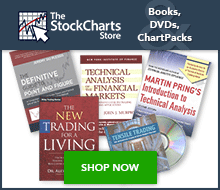 Technical analysis software programs come with dozens of indicators built in and even allow users to create their own. Given the amount of hype that is associated with indicators, choosing an indicator to follow can be a daunting task. Even with the introduction of hundreds of new indicators, only a select few really offer a different perspective and are worthy of attention. Strangely enough, the indicators that usually merit the most attention are those that have been around the longest time and have stood the test of time. When choosing an indicator to use for analysis, choose carefully and moderately. Attempts to cover more than five indicators are usually futile; it is best to focus on two or three indicators and learn their intricacies inside and out. Try to choose indicators that complement each other, instead of those that move in unison and generate the same signals. For example, it would be redundant to use two indicators that are good for showing overbought and oversold levels, such as Stochastics and RSI. Both of these indicators measure momentum and both have overbought/oversold levels. As their name implies, leading indicators are designed to lead price movements. Most represent a form of price momentum over a fixed lookback period, which is the number of periods used to calculate the indicator. For example, a 20-day Stochastic Oscillator would use the past 20 days of price action (about a month) in its calculation. All prior price action would be ignored. Some of the more popular leading indicators include Commodity Channel Index (CCI), Momentum, Relative Strength Index (RSI), Stochastic Oscillator and Williams %R. Many leading indicators come in the form of momentum oscillators. Generally speaking, momentum measures the rate-of-change of a security's price. As the price of a security rises, price momentum increases. The faster the security rises (the greater the period-over-period price change), the larger the increase in momentum. Once this rise begins to slow, momentum will also slow. As a security begins to trade flat, momentum starts to actually decline from previous high levels. However, declining momentum in the face of sideways trading is not always a bearish signal. It simply means that momentum is returning to a more median level. Momentum indicators employ various formulas to measure price changes. RSI (a momentum indicator) compares the average price change of the advancing periods with the average change of the declining periods. On the IBM chart, RSI advanced from October to the end of November. During this period, the stock advanced from the upper 60s to the low 80s. When the stock traded sideways in the first half of December, RSI dropped rather sharply (blue lines). This consolidation in the stock was quite normal and actually healthy. From these lofty levels (near 70), flat price action would be expected to cause a decline in RSI (and momentum). If RSI were trading around 50 and the stock began to trade flat, the indicator would not be expected to decline. The green lines on the chart mark a period of sideways trading in the stock and in RSI. RSI started from a relatively median level, around 50. The subsequent flat price action in the stock also produced relatively flat price action in the indicator and it remains around 50. There are many benefits to using leading indicators; most significantly, they allow for early signaling for entry and exit. Leading indicators generate more signals and allow more opportunities to trade. Early signals can also act to forewarn against a potential strength or weakness. Because they generate more signals, leading indicators are best used in trading markets. These indicators can be used in trending markets, but usually with the major trend, not against it. In a market that is trending up, the best use is to help identify oversold conditions for buying opportunities. In a market that is trending down, leading indicators can help identify overbought situations for selling opportunities. With early signals comes the prospect of higher returns and with higher returns comes the reality of greater risk. More signals and earlier signals mean that the chances of false signals and whipsaws increase. False signals will increase the potential for losses. Whipsaws can generate commissions that can eat away profits and test trading stamina. As their name implies, lagging indicators follow the price action and are commonly referred to as trend-following indicators. Rarely, if ever, will these indicators lead the price of a security. Trend-following indicators work best when markets or securities develop strong trends. They are designed to get traders in and keep them in as long as the trend is intact. As such, these indicators are not effective in trading or sideways markets. If used in trading markets, trend-following indicators will likely lead to many false signals and whipsaws. Some popular trend-following indicators include moving averages (exponential, simple, weighted, variable) and MACD. The chart above shows the S&P 500 ($SPX) with the 20-day simple moving average and the 100-day simple moving average. Using a moving average crossover to generate the signals, there were seven signals over the two years covered in the chart. Over these two years, the system would have been enormously profitable. This is due to the strong trends that developed from Oct-97 to Aug-98 and from Nov-98 to Aug-99. However, notice that as soon as the index starts to move sideways in a trading range, the whipsaws begin. The signals in Nov-97 (sell), Aug-99 (sell) and Sept-99 (buy) were reversed in a matter of days. Had these moving averages been longer (50- and 200-day moving averages), there would have been fewer whipsaws. Had these moving averages been shorter (10 and 50-day moving average), there would have been more whipsaws, more signals, and earlier signals. One of the main benefits of trend-following indicators is the ability to catch a move and remain in a move. Provided the market or security in question develops a sustained move, trend-following indicators can be enormously profitable and easy to use. The longer the trend, the fewer the signals and less trading involved. The benefits of trend-following indicators are lost when a security moves in a trading range. In the S&P 500 example, the index appears to have been range-bound at least 50% of the time. Even though the index trended higher from 1982 to 1999, there have also been large periods of sideways movement. From 1964 to 1980, the index traded within a large range bound by 85 and 110. Another drawback of trend-following indicators is that signals tend to be late. By the time a moving average crossover occurs, a significant portion of the move has already occurred. The Nov-98 buy signal occurred at 1130, about 19% above the Oct-98 low of 950. Late entry and exit points can skew the risk/reward ratio. For technical indicators, there is a trade-off between sensitivity and consistency. In an ideal world, we want an indicator that is sensitive to price movements, gives early signals and has few false signals (whipsaws). If we increase the sensitivity by reducing the number of periods, an indicator will provide early signals, but the number of false signals will increase. If we decrease sensitivity by increasing the number of periods, then the number of false signals will decrease, but the signals will lag and this will skew the reward-to-risk ratio. The longer a moving average is, the slower it will react and fewer signals will be generated. As the moving average is shortened, it becomes faster and more volatile, increasing the number of false signals. The same holds true for the various momentum indicators. A 14 period RSI will generate fewer signals than a 5 period RSI. The 5 period RSI will be much more sensitive and have more overbought and oversold readings. It is up to each investor to select a timeframe that suits his or her trading style and objectives. An oscillator is an indicator that fluctuates above and below a centerline or between set levels as its value changes over time. Oscillators can remain at extreme levels (overbought or oversold) for extended periods, but they cannot trend for a sustained period. In contrast, a security or a cumulative indicator like On-Balance-Volume (OBV) can trend as it continually increases or decreases in value over a sustained period of time. As the indicator comparison chart shows, oscillator movements are more confined and sustained movements (trends) are limited, no matter how long the time period. Over the two-year period, Moving Average Convergence Divergence (MACD) fluctuated above and below zero, touching the zero line about 18 times. Also, notice that each time MACD surpassed +80 the indicator pulled back. Even though MACD does not have an upper or lower limit on its range of values, its movements appear confined. OBV, on the other hand, began an uptrend in March 2003 and advanced steadily for the next year. OBV's movements are not confined, allowing long-term trends to develop. There are many different types of oscillators, some belonging to more than one category. In this article, we discuss two broad categories of oscillators: centered oscillators which fluctuate above and below a center point or line and banded oscillators which fluctuate between overbought and oversold extremes. Generally, centered oscillators are best suited for analyzing the direction of price momentum, while banded oscillators are best suited for identifying overbought and oversold levels. Centered oscillators fluctuate above and below a central point or line. These oscillators are good for identifying the strength or weakness, or direction, of momentum behind a security's move. In its purest form, momentum is positive (bullish) when a centered oscillator is trading above its center line and negative (bearish) when the oscillator is trading below its center line. MACD is an example of a centered oscillator that fluctuates above and below zero. MACD is the difference between the 12-day EMA and 26-day EMA of a security. The further one moving average moves away from the other, the higher the reading. Even though there is no range limit to MACD, extremely large differences between the two moving averages are unlikely to last for long. MACD is unique in that it has lagging elements as well as leading elements. Moving averages are lagging indicators and would be classified as trend-following or lagging elements. However, by taking the differences in the moving averages, MACD incorporates aspects of momentum or leading elements. The difference between the moving averages represents the rate of change. By measuring the rate-of-change, MACD becomes a leading indicator, but still with a bit of lag. With the integration of both moving averages and rate-of-change, MACD has forged a unique spot among oscillators as both a lagging and a leading indicator. Rate-of-change (ROC) is a centered oscillator that also fluctuates above and below zero. As its name implies, ROC measures the percentage price change over a given time period. For example, the 20-day ROC would measure the percentage price change over the last 20 days. The bigger the difference between the current price and the price 20 days ago, the higher the value of the ROC Oscillator. When the indicator is above 0, the percentage price change is positive (bullish). When the indicator is below 0, the percentage price change is negative (bearish). As with MACD, ROC is not bound by upper or lower limits. This is typical of most centered oscillators and can make it difficult to spot overbought and oversold conditions. This ROC chart indicates that readings above +20% and below -20% represent extremes and are unlikely to last for an extended period of time. However, the only way to gauge that +20% and -20% are extreme readings is from past observations. Also, +20% and -20% represent extremes for this particular security and may not be the same for other securities. Banded oscillators offer a better alternative to gauge extreme price levels. For RSI, the bands for overbought and oversold are usually set at 70 and 30 respectively. A reading greater than 70 would be considered overbought, while a reading below 30 would be considered oversold. For the Stochastic Oscillator, a reading above 80 is overbought, while a reading below 20 is oversold. Even though these are the recommended band settings, certain securities may not adhere to these ranges and might require more fine-tuning. Making adjustments to the bands is usually a judgment call that will reflect a trader's preferences and the volatility of the security. Many, but not all, banded oscillators fluctuate within set upper and lower limits. The Relative Strength Index (RSI) and Stochastic Oscillator, discussed above, are both range-bound by 0 and 100 and will never go higher than 100 or lower than zero. The Commodity Channel Index (CCI), on the other hand, is an example of a banded oscillator that is not range-bound. CCI measures the current price relative to the average price over a given period of time; the oscillator is considered unbound because there is theoretically no upper and lower limit on that relative price difference. In practice though, the majority of CCI values fall between -100 and +100. These fairly consistent levels make CCI useful as a banded oscillator, and just like its range-bound relatives, it can be used to determine overbought and oversold levels. While -100 and +100 are the recommended band levels, chartists may make adjustments to the levels based on their personal trading style and the volatility of the underlying security. Centered oscillators are best used to identify the underlying strength or direction of momentum behind a move. Broadly speaking, readings above the center point indicate bullish momentum, while readings below the center point indicate bearish momentum. The biggest difference between centered oscillators and banded oscillators is the latter's ability to identify extreme readings. While it is possible to identify extreme readings with centered oscillators, they are not ideal for this purpose. Banded oscillators are best suited to identify overbought and oversold conditions. Oscillators generate buy and sell signals in various ways. Some signals are geared towards early entry, while others appear after the trend has begun. In addition to buy and sell signals, oscillators can signal that something is amiss with the current trend or that the current trend is about to change. Even though oscillators can generate their own signals, it is important to use these signals in conjunction with other aspects of technical analysis. Most oscillators are momentum indicators and only reflect one characteristic of a security's price action. Volume, price patterns and support/resistance levels should also be taken into consideration. Divergence is a key concept behind many signals for oscillators as well as other indicators. Divergences can serve as a warning that the trend is about to change or set up a buy or sell signal. There are two types of divergences: positive and negative. In its most basic form, a negative divergence is when an indicator declines while the underlying security advances. A positive divergence is when the indicator advances while the underlying security declines. A negative divergence occurs when the underlying security moves to a new high, but the indicator fails to record a new high and forms a lower high. For momentum indicators, a negative divergence shows slowing upside momentum that can sometimes foreshadow a bearish reversal. Not all negative divergences result in good signals, especially during a strong uptrend. On the Staples (SPLS) chart above, the stock formed a higher high in September, but the MACD did not exceed its prior high. A negative divergence formed and the MACD soon moved below its signal line (red). A positive divergence occurs when a security moves to a new low, but the indicator holds above its prior low to form a higher low. For momentum indicators, a positive divergence shows less downside momentum that can sometimes foreshadow a bullish reversal. Not all positive divergences result in good signals, especially in a strong downtrend. On the Sprint (S) chart above, the stock formed a lower low in early September, but RSI held above its prior low to form a positive divergence. Also, notice that RSI was oversold in mid-August and held above 30 in September. The subsequent move above 50 in RSI and the breakout in Sprint confirmed the signal. Sprint later moved back below its breakout and warranted a reassessment at that time. Divergences, both positive and negative, can also form in non-momentum indicators like On Balance Volume, the Accumulation Distribution Line, the AD Line and Chaikin Money Flow. On the Expeditors (EXPD) chart above, the stock moved to a new high in September, but On Balance Volume (OBV) did not confirm with a higher high. A lower high is forming in OBV and the indicator moved below its 10-day SMA. Banded oscillators are designed to identify overbought and oversold extremes. Since these oscillators fluctuate between extremes, they can be difficult to use in trending markets. Banded oscillators are best used in trading ranges or with securities that are not trending. In a strong trend, users may see many signals that are not really valid. If a stock is in a strong uptrend, buying on oversold conditions will work much better than selling on overbought conditions. In a strong trend, oscillator signals against the direction of the underlying trend are less robust than those with the trend. The trend is your friend and it can be dangerous to fight it. Even though securities develop trends, they also fluctuate within those trends. If a stock is in a strong uptrend, buying when oscillators reach oversold conditions (and near support tests) will work much better than selling on overbought conditions. During a strong downtrend, selling when oscillators reach overbought conditions would work much better. If the path of least resistance is up (down), then acting on only bullish (bearish) signals would be in harmony with the trend. Attempts to trade against the trend carry added risk. When the trend is strong, banded oscillators can remain near overbought or oversold levels for extended periods. An overbought condition does not indicate that it is time to sell, nor does an oversold condition indicate that it is time to buy. In a strong uptrend, an oscillator can reach an overbought condition and remain so as the underlying security continues to advance. A negative divergence may form, but a bearish signal against the uptrend should be considered suspect. In a strong downtrend, an oscillator can reach an oversold condition and remain so as the underlying security continues to decline. Similarly, a positive divergence may form, but a bullish signal against the downtrend should be considered suspect. This does not mean counter-trend signals won't work, but they should be viewed in proper context and considered with other aspects of technical analysis. The first step in using banded oscillators is to identify the upper and lower bands that mark the extremities. For RSI, anything below 30 and above 70 represents an extremity. For the Stochastic Oscillator, anything below 20 and above 80 represents an extremity. We know that when RSI is below 30 or the Stochastic Oscillator is below 20, an oversold condition exists. By that same token, when RSI is above 70 and the Stochastic Oscillator is above 80, an overbought condition exists. Identification of an overbought or oversold condition should serve as an alert to monitor other technical aspects (price pattern, trend, support, resistance, candlesticks, volume or other indicators) with extra vigilance. The simplest method to generate signals is to note when the upper and lower bands are crossed. If a security is overbought (above 70 for RSI and 80 for the Stochastic Oscillator) and moves back down below the upper band, then a sell signal is generated. If a security is oversold (below 30 for RSI and 20 for the Stochastic Oscillator) and moves back above the lower band, then a buy signal is generated. The Cisco (CSCO) chart shows that the Stochastic Oscillator can change from oversold to overbought quite quickly. Much depends on the number of time periods used to calculate the oscillator. A 10-day Slow Stochastic Oscillator will be more volatile than a 20-day. The thin green lines indicate when the Stochastic Oscillator touched or crossed the oversold line at 20, while the thin red lines indicate when the oscillator touched or crossed the overbought line. CSCO was in a strong uptrend at the time and experiencing little selling pressure. Therefore, trying to sell when the oscillator crossed back below 80 would have been against the uptrend and not the proper strategy. When a security is trending up or has a bullish bias, traders would be better off looking for oversold conditions to generate buying opportunities. We can also see that much of the upside for the stock occurred after the Stochastic Oscillator advanced above 80 (thin red lines). The green circle in August shows a buy signal that was generated with three separate items: one, the oscillator moved above 20 from oversold conditions; two, the oscillator moved above its 3-day MA; and three, the oscillator formed a positive divergence. Confirmation from these three items makes for a more robust signal. After the buy signal, the oscillator was in overbought territory a mere 4 days later. However, the stock continued its advance for 2-3 weeks before reaching its high. The Microsoft (MSFT) chart reveals trading opportunities with the Relative Strength Index (RSI). Because a 14-period RSI rarely moved below 30 and above 70, a 10-period RSI was chosen to increase sensitivity. With the intermediate-term and long-term trends decidedly bearish, savvy traders could have sold short each time RSI reached overbought (black vertical lines). More aggressive traders could have played the long side each time RSI dipped below 30 and then moved back above this oversold level. The first two buy signals were generated with a positive divergence and a move above 30 from oversold conditions. The third buy signal came after RSI briefly dipped below 30. Keep in mind that these three signals were against the larger downtrend and trading strategies should be adjusted accordingly. As the name implies, centerline crossover signals apply mainly to centered oscillators that fluctuate above and below a centerline. Traders have been also known to use centerline crosses with RSI in order to validate a divergence or signal generated from an overbought or oversold reading. However, most banded oscillators, such as RSI and Stochastics, rely on divergences and overbought/oversold levels to generate signals. The middle ground is a bit of a no man's land for banded oscillators and is probably best left to other tools. For our purposes, the analysis of centerline crossovers will focus on centered oscillators such as Chaikin Money Flow, MACD and Rate-of-Change (ROC). A centerline crossover is sometimes interpreted as a buy or sell signal. A buy signal would be generated with a cross above the centerline and a sell signal with a cross below the centerline. For MACD or ROC, a cross above or below zero would act as a signal. Movements above or below the centerline indicate that momentum has changed from either positive to negative or negative to positive. When a centered momentum oscillator advances above its centerline, momentum turns positive and could be considered bullish. When a centered momentum oscillator declines below its centerline, momentum turns negative and could be considered bearish. On this Intel (INTC) chart with MACD and ROC, there have been a number of signals generated from the centerline crossover. There were a couple of excellent signals, but there were also plenty of false signals and whipsaws. This highlights some of the challenges associated with trading oscillator signals. Also, it stresses the importance of combining various signals in order to create more robust buy and sell signals. Some traders also criticize centerline crossover signals as being too late and missing too much of the move. A centerline crossover can also act as a confirmation signal to validate a previous signal or reinforce the current trend. If there were a positive divergence and bullish moving average crossover, then a subsequent advance above the centerline would confirm the previous buy signal. Failure of the oscillator to move above the centerline could be seen as a non-confirmation and act as an alert that something was amiss. On the Intel (INTC) chart with MACD, the centerline crossover acts as the third in a series of bullish signals. The higher low forming signaled a potential positive divergence. The bullish moving average crossover confirmed the positive divergence. The bullish centerline crossover reinforced the move. Some traders would worry about missing too much of the move by waiting for the third and final confirmation. However, this can be a more reliable signal and help to avoid whipsaws and false signals. It is true that waiting for the third signal will reduce profits, but it can also help reduce risk. Even after the third signal, Intel still has plenty of upside left. Chaikin Money Flow is an example of a centered oscillator that places importance on crosses above and below the centerline. Divergences and overbought/oversold levels are all secondary to the absolute level of the indicator. The direction of the oscillator's movement is important but needs to be placed in the context of the absolute level. The longer the oscillator is above zero, the more evidence of accumulation. The longer the oscillator is below zero, the more evidence of distribution. Hence, Chaikin Money Flow is considered to be bullish when the oscillator is trading above zero and bearish when trading below zero. On the IBM chart, Chaikin Money Flow began to turn down in July. At this time, the stock was declining with the market and the decline in the oscillator was normal. However, in the second half of August, concerns began to grow when the oscillator failed to continue up with the stock and fell below zero. As the stock advanced further, Chaikin Money Flow continued to deteriorate. This served as a signal that something was amiss. Banded oscillators are best used to identify overbought and oversold conditions. However, overbought is not meant to act as a sell signal, and oversold is not meant to act as a buy signal. Overbought and oversold situations serve as an alert that conditions are reaching extreme levels and close attention should be paid to the price action and other indicators. To improve the robustness of oscillator signals, traders can look for multiple signals. The criteria for a buy or sell signal could depend on three separate yet confirming signals. A buy signal might be generated with an oversold reading, positive divergence, and bullish moving average crossover. Conversely, a sell signal might be generated from a negative divergence, bearish moving average crossover, and bearish centerline crossover. Traditional chart pattern analysis can also be applied to oscillators. This is a bit trickier but can help to identify the strength behind an oscillator's move. Looking for higher highs or lower lows can help confirm the previous analysis. A trend line breakout can signal that a change in the direction of the momentum is imminent. It is dangerous to trade an oscillator signal against the major trend of the market. In bull moves, it is best to look for buying opportunities through oversold signals, positive divergences, bullish moving average crossovers and bullish centerline crossovers. In bear moves, it is best to look for selling opportunities through overbought signals, negative divergences, bearish moving average crossovers and bearish centerline crossovers. Finally, oscillators are most effective when used in conjunction with pattern analysis, support/resistance identification, trend identification and other technical analysis tools. By being aware of the broader picture, oscillator signals can be put into context. It is important to identify the current trend or even to ascertain if the security is trending at all. Oscillator readings and signals can have different meanings in differing circumstances. By using other analysis techniques in conjunction with oscillator reading, the chances of success can be greatly enhanced.